Introduced in the early 1990’s by the South Korean manufacturer, Hyundai, the Elantra is a compact car that combines nimble and secure handling with a fairly comfortable, well-controlled ride. 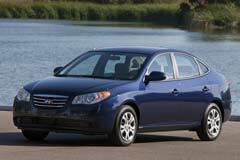 This economy priced sedan did not start off with a good note with its overall shoddiness and unreliability. Today, the car has earned its reputation for better reliability, agreeable performance and better appearance. The older models of Elantra featured several budget features including Mitsubishi designed 1.6 L engine, front airbags, and power-operated side mirrors and optional alloy 7 spoke wheels. However, the newer models were given a facelift by adding a variety of new features. If you are looking for a small sedan that fits your tight budget, used Hyundai Elantra belongs in your short list of contenders. The current Hyundai Elantra represents the fifth generation, and features a 1.8 liter four-cylinder engine, nicely laid out interiors, decent rear-seat room and full power accessories.